Odyssey 165™ touring rowboat set up for solo rowing. The Odyssey 165™ touring rowboat is designed specifically for one FrontRower™ rowing station. It can be rowed solo or solo with a passenger. Our Odyssey rowboats are pure touring rowboats designed solely to enhance the pleasure of rowing. They possess a comfortable blend of seaworthiness stability, efficiency, and carrying capacity. Odyssey touring rowboats are narrower and more lightly built than traditional oar-on-gunwale type row boats, and will move through the water more easily. Unlike shells, they will have enough stability to handle chop and wakes from motor boats, and will be roomy enough to bring some gear along. They are comfortable for all day long rowing. They are also perfect for exercise rowing. They are great for flat water rivers, lakes, and bays--where they can handle reasonable chop and wakes from motor boats. They are not suitable for extreme conditions (white water rapids, heavy surf, breaking waves, high winds). Laminated cell core bottom panel adding extra strength and floatation, and eliminating the need for frames. Flat bottom with dihedral bilge panels that flair out above the waterline, making for a narrow waterline (for efficiency) with the secondary stability of a beamier boat. Reverse curve in the chine at the bow, following the wave curve. Counter stern making the boat an efficient double-ender below the waterline. 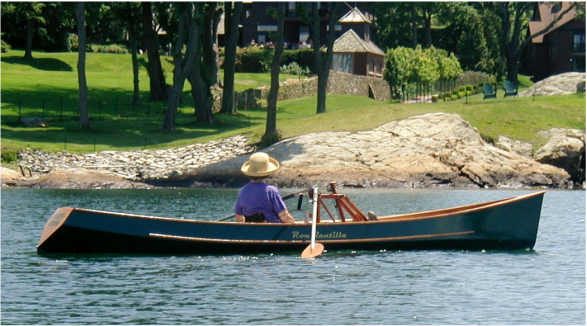 Odyssey rowboats are available as kits or plans or custom built by special order. Waterline length: 15 ft. 8 in. Waterline length: 16 ft. 0 in.